A new electronic visa waiver (EVW) scheme was launched by the Home Office in February this year, making it easier for Kuwaiti passport holders to travel to the UK for business and tourism. To cover the costs of the scheme a fee of £15 (equivalent) is being introduced from 23 May 2016, which is still significantly lower than the cost of a UK visit visa. The charge is being introduced to coincide with the roll-out of the new electronic visa system to citizens of Oman, Qatar and UAE, and will be the same (low fee) for all four Gulf States. The EVW allows Kuwaiti passport holders to travel to the UK for a visit of up to six months by filling in an online form at least 48 hours before they travel. The scheme removes the need to give biometrics, attend a visa application centre or hand in passports in advance of travel. It also allows passengers to upload a copy of their passport biographic data page so that details can be checked for accuracy prior to travel, meaning the system is simple and secure. 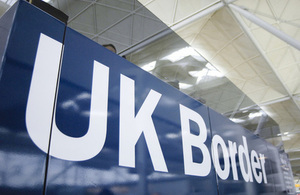 Since the scheme’s successful introduction earlier this year, more than thirteen thousand Kuwaitis have benefited from using an electronic visa waiver to come to the UK. Further details on the EVW are available here.